One of the macroeconomic objectives is economic growth. Economic growth is the realised increase in potential GDP of an economy over a period of time. – it is important to know that there are a number of definition of what economic growth is. Therefore, if exam question asks you to talk about economic growth, be very careful how you define it. This definition connects both of those below. Actual growth which takes place when an economy is below full employment level of income and moves towards its potential level of GDP (by employing more of its resources). Potential growth occurs in the long-run and it is associated with the increase in quantity and/or quality of factors of production (this shifts the vertical part of the Keynesian AS curve; the vertical LRAS curve in a Monetarist diagram). Also, see the diagram as you are required to know how to demonstrate economic growth using a PPC (Production Possibilities Curve). Actual growth is from point A to point B. 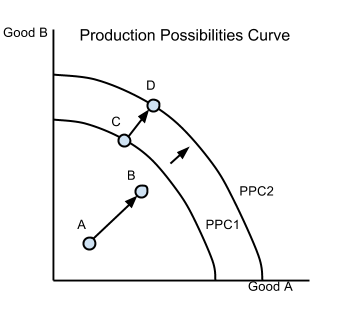 Potential growth is the shift of the PPC curve PPC1 to PPC2.